“Soon,” of course, from the divine perspective, may imply a substantially longer time frame than from the human one. Yet with all the upheaval that we see around us, it does seem as though this world-changing event and Baba’s Manifestation could happen in our twenty-first century. I was tracking the news for years, trying to discern a pattern in brush-fire wars and natural disasters that might shed light on this. Then, a couple of years ago, an old and close friend of mine, not a Baba-lover, announced that he felt we had passed the point of no return on climate change and that he expected mass extinction of humanity (more than ninety percent, I think he said). This reminded me of Baba’s statement on three-fourths of the world, and I felt, intuitively or instinctively, that he had identified the key factor. Climate change is a more powerful, sweeping, and universal force than most wars or natural disasters. I suppose a full-scale nuclear war or a large comet strike could have a similar impact. 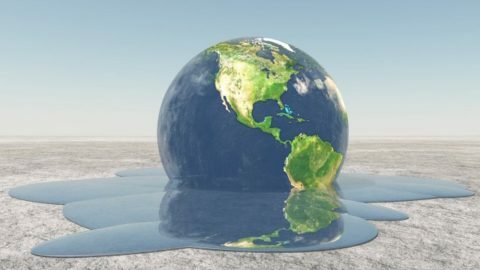 But climate change—deceptively slow but insidiously inevitable, already underway, and resulting from our own karma—strikes me as a most compelling possibility. Climate change does not preclude wars and natural disasters as factors in the overall picture of destruction. I would think that wars prompted by food crises would be inevitable as conditions worsen. But environmental catastrophe seems central to me. We are the frogs floating in a pot of water gradually coming to a boil, heated by our collective materialist karma. In view of these issues, it struck me as highly significant that the Glow International, a widely read Baba journal, published in Fall 2015 a letter to the editor uniting environmental concerns and spirituality, titled “Signs of Meher Baba’s Awakening in the Convergent Paths of Sustainability and Spirituality.” The author, Thomas Sawyer Hopkins, comes to the subject uniquely qualified, as both a Baba lover and an environmental scientist (Professor Emeritus, Oceanography and Environmental Science, North Carolina State University). He believes that the present century will focus on “developing social responsibility and respecting human interdependence with nature and among nations towards the common goal of sustainability. . . . From a scientific perspective the global human society is caught in a sustainability crisis. . . . The footprint of humanity is stamping out its habitat. . . .” A footnote refers to a sobering mathematical statement from the Global Footprint Network: It currently takes 18 months to regenerate the natural resources humanity uses in one year. By the 2030s, the network adds, it is expected to take two years to regenerate what we use in one year. In other words, rather than living off the interest of our planetary resource account, we’re profligately blowing the principal. Hopkins concludes, “Thus, sustainability is impossible without a significant level of spirituality.” He believes that a convergence of the two paths (sustainability and spirituality) is indeed occurring, giving him hope that they will be brought into “alignment with Baba’s description of spiritual understanding”; his letter includes a chart delineating their similarities (and contrasting them with the currently operative paradigm). There is a big job to be done, Professor Hopkins implies, starting now. I haven’t let go of the notion that it’s a job for the New Humanity, carrying out planetary repair as part of the New Life labor phase. Unfortunately, my assumption is somewhat reminiscent of the old joke: “Q: How many Baba-lovers does it take to change a light bulb? A: None. Baba will take care of it.” In other words, “Sure, the work will have to be done. But in this lifetime? Right now?” It’s not a direct parallel, of course, but the point is my implied passivity. Hopkins makes a good case for a contrary point of view. The hinge statements are “the wave will recede” (Baba) and “It seems to me that Meher Baba wants us to prepare for the awakening” (Hopkins). Could it be that the New Humanity is here now? Does the labor phase start now? And what, exactly, are we supposed to do? I have no idea. But I am reminded of two books by historians William Strauss and Neil Howe, in which they delineate a recurring cycle of generational archetypes throughout American history, and, more broadly, Anglo-American history. They also identify crisis points about every eighty years, such as the American Civil War and the great crisis of the twentieth century, the Depression of the 1930s and World War II.3 A specific cluster of generations successfully responded to the latter crisis. The overall planning and philosophical construct were provided by an idealist generation belonging to a “Prophet” archetype: Franklin Roosevelt and his “old gray men.” The implementational leadership was in the hands of a reactive generation of ”Nomads”: Eisenhower, Patton, Marshall, et al. And the implementers, the troops, were the young adults of the time, the civic “Hero” generation, later misnamed the “greatest generation.” (A fourth generation, the empathic “Artist” group, was mostly too young to be actively involved at the time, though quite important in later developments.) I say “greatest generation” is a misnomer, not to deny that generation’s genuinely noble sacrifices and accomplishments, but to stipulate that there is no one great generation. Each generation has its own significant purpose in, and contribution to, the sweep of history. It took all three generations in those exact stages of life to accomplish the grand task. The young generation needed hard-nosed pragmatists to lead them, and those pragmatists needed idealists to tell them why and show them the big picture. Strauss and Howe point out that the generational cycle has come around to the same cluster: the idealist Boomers, the pragmatic GenX, and the cooperative “good kids,” the Millennials. Not coincidentally, they expect a major crisis, presumably global, in the 2020s, some eighty years after World War II. But is there a Roosevelt out there now? More to the point, as Hopkins notes, governments and corporations show very few signs of acknowledging or effectively responding to the current crisis. We have the ultimate inspirational leader in Meher Baba, so we don’t even need a Roosevelt. But can the idealists convince the pragmatists to participate or inspire the potential heroes to join up? So far, though the sustainability movement is inspired in great part by compassion and love (mixed with anger), it is not noticeably God-centered. And the spiritual communities aren’t noticeably addressing the sustainability crisis, at least on a scale commensurate with the magnitude of the problem. The two groups have much in common, as Hopkins demonstrates in his chart, but they are far from congruent at this point. So, what next? I can’t imagine exactly how Meher Baba’s Will is going to play out, as it must. I am not unmindful of Baba’s explicit caution in his “Clarification and Confirmation” of The Final Declaration, that his statement “Before I break my silence or immediately after it, three-fourths of the world will be destroyed” was said “in my ‘language’ alone,” and I acknowledge that I could be misinterpreting what he said. Nonetheless, his words seem concrete, and certainly evocative. Climate change as the means of this destruction immediately struck me as likely when my friend posited it. Professor Hopkins hammers it home. And it seems reinforced by other statements from Baba to the effect that, for example, “food will not be available, and people will eat the cloth off their backs,”4 since the crops wither when the environment and the atmosphere are trashed and water supplies dry up. I am grateful to Professor Hopkins for broadening the discussion for the worldwide Baba community and integrating the spiritual and scientific viewpoints. And his assertion that action can and should be taken now is, I believe, a proposition that deserves serious consideration. In Avatar of the Age Meher Baba Manifesting, in the video Three Quarters of the World, in his “Awakenings,” and in many talks and Internet chats. See their co-authored books Generations: The History of America’s Future, 1584 to 2069 (1992) and The Fourth Turning: What the Cycles of History Tell Us about America’s Next Rendezvous with Destiny (1997). Quoted by Mansari Desai, in Glow International, Feb. 1997, p. 9. See “The Worst Scenario” on this site.